Cage the Elephant | Do You Hear The Music? The 2015 GRAMMY nominations were announced this morning. Take a look below at the nominees and visit GRAMMY.com for more details or peep HERE for more from Billboard. 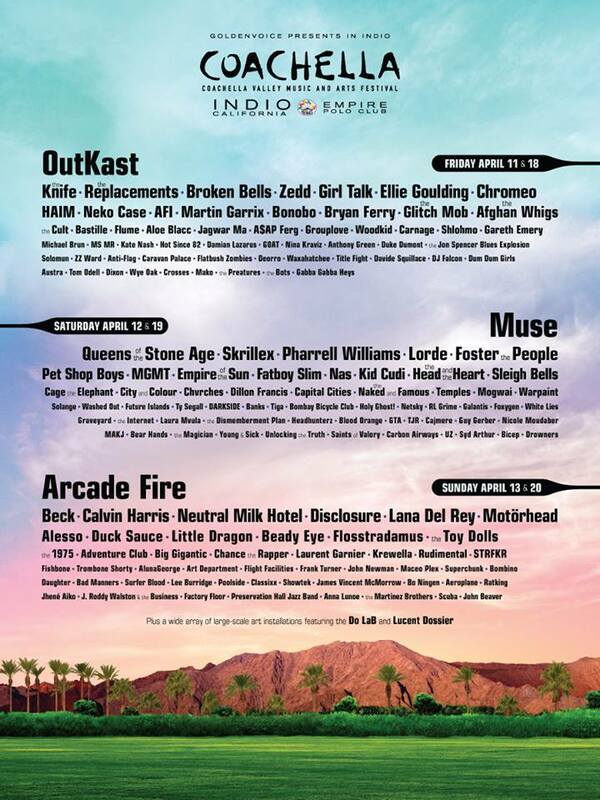 Festival News: Coachella 2014 Lineup Is Here! Just dropped this evening, the 2014 Coachella lineup. Take a look and maybe I’ll see you out in Indio this April. Pretty strong from top to bottom and boy oh boy are there some gems in the tiny font. And yes, I can’t believe I’m writing this but Miley Cyrus – “You’re Gonna Make Me Lonesome When You Go.” See for yourself, below. You can click here for the official release regarding the album, artists, making, etc. and how you too can support Amnesty International. 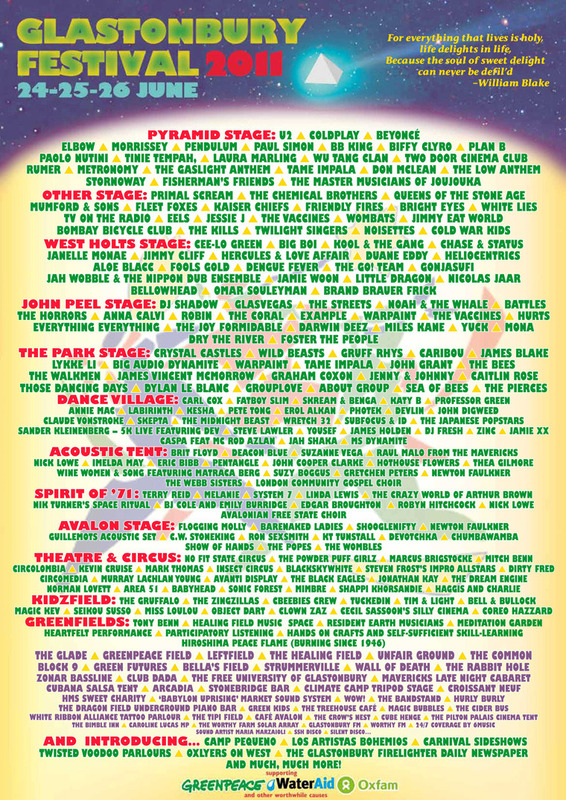 Out of all the festivals this summer I really am starting to think that Glastonbury has the best line-up of them all. June 24-26 this is going to be the place to be, just look at the poster below and your jaw will drop. Insane! I mean the main two stages include: U2, Coldplay, Beyoncé, Morrissey, Elbow, Pendulum, Biffy Clyro, Paolo Nutini, Plan B, B.B. 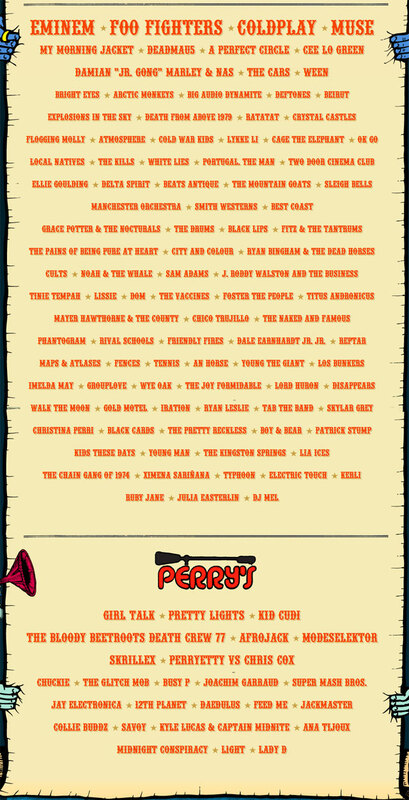 King, Tinie Tempah, Paul Simon, Wu Tang, Clan Rumer, Laura Marling, Two Door Cinema Club, The Gaslight Anthem, Don McLean, Metronomy, Tame Impala, The Low Anthem, The Master Musicians of Joujouka Stornoway, Fisherman’s Friends, Primal Scream, The Chemical Brothers, Queens of the Stone Age, Mumford and Sons, White Lies, Kaiser Chiefs, Fleet Foxes , Friendly Fires, The Eels, Bright Eyes, Jimmy Eat World, TV on the Radio, The Wombats, The Kills, Bombay Bicycle Club, The Vaccines, Jessie J, The Noisettes, The Naked and The Famous, Twilight Singers, Cold War Kids, Brother Treetop Flyers, Clare Maguire, Chipmunk, Alice Gold and Dan Mangan.